The concept of Air cargo is any goods or commodities carried in an aircraft. Air cargo are defined in two segments such as air freight and airmail. The air freight segment of the global air cargo market is expected to hold the major market share during the forecast period and is estimated to bring in revenues of nearly US$98.81 bn by the end of 2020. Factors such as rapid development of businesses, building of cargo hubs, and rapid growth of the e-commerce business model is expected to drive the prospects for growth in this market segment. The global air cargo market is expected to reach a valuation of US$130.12 bn by the end of 2025. During the forecast period of 2017 and 2025, the global market is expected to surge at a CAGR of 4.9%. As the air cargo market is growing, there are new policies and strategies ensuring for the growth in the market ‘Open skies’ is an international policy that calls for the liberalization of the rules and regulations in the aviation industry especially air cargo industry has greater impact of this policy. There are different types of aircrafts such as cargo, passenger, and combi aircraft. Cargo aircraft are dedicated mainly for carrying parcels, they carry freight by nose-loading or side loading. Main deck and belly are meant for carrying goods in cargo aircraft. Passenger aircraft is different from cargo aircraft. In passenger aircraft, the space not occupied by passenger luggage is used for cargo. The spare volume is used by side-loading in the airplane. Combi aircraft carry goods or commodities by nose-loading and side-loading on the main deck and in the belly with passenger’s luggage. The global air cargo market has been segmented on the basis of type, service, end-user, destination, and geography. On the basis of type, the market is segmented into air freight and air mail. Out of these, the air freight segment is likely the lead the global market in the coming years. The market is further segmented on the basis of service, the service includes express and regular. On the basis of end-user the market segments include consumer electronics, retail, third party logistics, food and beverages, pharmaceuticals and healthcare, and others. The report suggests that the pharmaceuticals and healthcare industry is likely to offer the global market a plethora of opportunities. The need for immediate medical attention in several areas that are affected by natural calamities and war-torn areas are likely to augment this segment. The demand for time-sensitive materials belonging to the healthcare sector are also expected to boost the segment. The air cargo market is also segmented by destination which includes domestic and international. The air cargo market report provides analysis for the period 2015–2025, wherein the period from 2017 to 2025 is the forecast period and 2016 is the base year. The report covers all the major trends and services playing a key role in air cargo market growth over the forecast period. It also highlights the drivers, restraints, and opportunities expected to influence market’s growth during the said period. 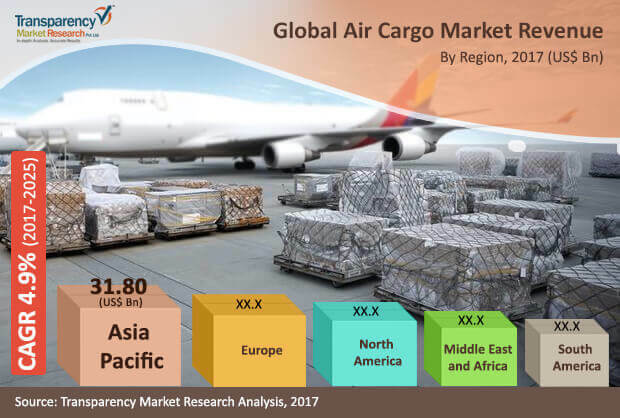 The study provides a holistic perspective on the air cargo market’s growth throughout the above mentioned forecast period in terms of revenue (in US$ Mn), across different geographies, including Asia Pacific, South America, North America, Europe, and Middle East & Africa (MEA). The market overview section of the report demonstrates the market dynamics and trends, such as the drivers, restraints, and opportunities that influence the current nature and future status of this market. An attractiveness analysis has also been provided for every geographic region in the report, in order to give a thorough analysis of the overall competitive scenario of the air cargo market, globally. Moreover, the report provides an overview of the various strategies of key players present in the market. Market definition and introduction chapter helps in understanding different trends and services of air cargo along with their types and services which are included in the report. The report segments the global air cargo market on the basis of type into air freight, and air mail. The market is further segmented into express and regular by services. By end-use, the market has been classified into consumer electronics, retail, third party logistics, food and beverages, pharmaceuticals & healthcare and others. By destination, the market has been segmented into domestic, and International. Thus, the report provides in-depth cross-segment analysis of the air cargo market and classifies it into various levels, thereby providing valuable insights at the macro as well as micro levels. On the basis of country, North American market is divided into The U.S., Canada and Mexico. Similarly, Europe market is divided into Germany U.K., France, and Rest of Europe. Asia Pacific has been segmented into China, Japan, Australia, and Rest of Asia Pacific. Middle East and Africa covers the G.C.C., South Africa and Rest of Middle East and Africa. Similarly, South America region includes Brazil, and Rest of South America. This report provides all the essential information required to understand the air cargo and its types and services. Also, the report provides insights related to the services and different end-users according to the various geographical regions mentioned above. These policies and regulations are directly or indirectly influencing the air cargo market. Furthermore, Porter’s Five Forces analysis explains the factors which are currently affecting the air cargo market. This report also provides the value chain analysis for the air cargo which explains the participants of the value chain. The report also highlights the competitive landscape of the air cargo market, thereby positioning all the major players according to their geographic presence and recent key developments. The comprehensive air cargo market estimates are the result of our in-depth secondary research, primary interviews, and in-house expert panel reviews. These market estimates have been analyzed by taking into account the impact of different political, social, economic, technological, and legal factors along with the current market dynamics affecting the air cargo market’s growth. Cathay Pacific Cargo, FedEx Express, UPS Airlines, DHL Aviation, Korean Air Caro, Lufthansa Cargo, China Airlines Cargo, Singapore Airlines Cargo, Emirates SkyCargo, Cargolux are some of the major players operating within the global air cargo market profiled in this study. Details such as financials, SWOT analysis, business strategies, recent developments, and other such strategic information pertaining to these players have been duly provided as part of company profiling.